Mr. Laird, as a long time fan and animator I think it’s great to see all of the concept pieces you put up. Since I was a kid the Turtles stories and cast of characters have inspired me and fueled my love of comics. As an adult, the unique storytelling and layouts in TMNT have influenced me in my art. Even though I have a degree in animation and have started my career as an animator, I hope to work in the comic book industry. With that in mind I’ve been working on a TMNT comic in order to display my penciling ability and black and white lighting skills. Please take a look at my portfolio site. I am hoping that I will be able to help you with future projects and would appreciate any constructive criticism so that I can learn how to improve my skills and work for a publisher like Mirage comics. On the top row of projects I have two TMNT links. The first is the best three pages and the second contains all seven pages completed so far. 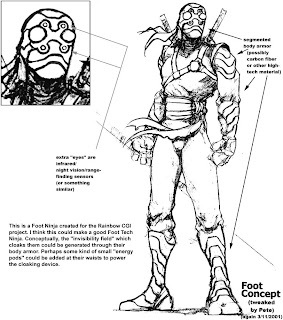 -->> ..this sweet design setup was implemented by Karai and the Foot as of Volume 4 #4 .. Karai wears this with a fierce stance and feminine touch. -->> Gary , ..real slick !! Hey Peter, I was wondering how much was the cost per episode for a CGI TV project back in 2001, I know that back in 2003 a single animated episode of the 2k3 cartoon cost about 300,000 dollars. Thanks Tokka and Sarah. I've been working pretty hard on these pages. -->> .. comin' from me it's prolly like listening to a drunk canary in a mineshaft ..
but : Hang tuff' ,kicker ! !